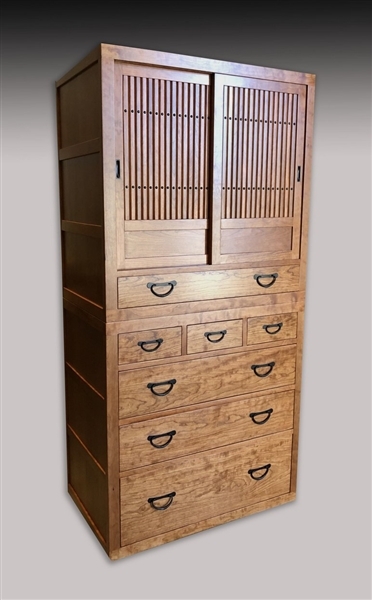 Gorgeous, Japanese-inspired, two-piece isho-dansu clothing chest tansu from from our Nara Collection, contemporary. 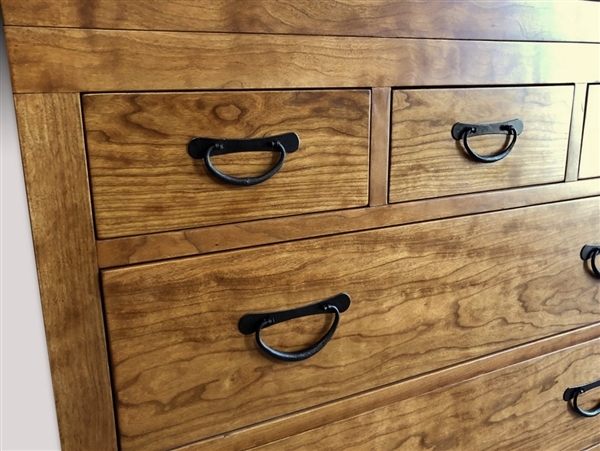 Shown in richly grained cherry wood, but also available in walnut and beech (price varies). Traditional design features four drawers at center for ease of use and a pair of slatted, metal-studded paneled cabinets at top and base. 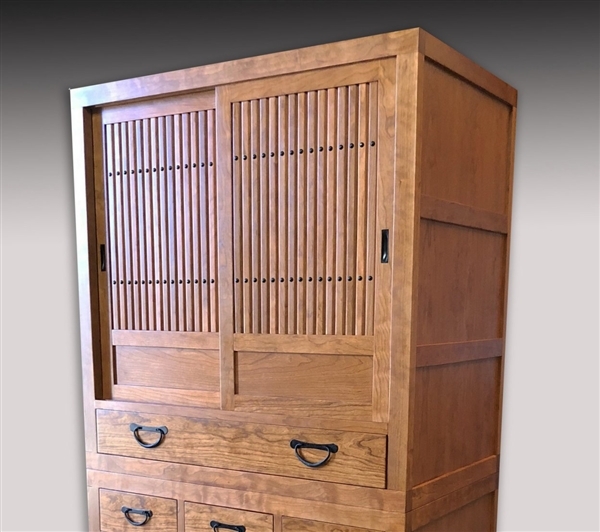 The Nara Collection features tansu exhibiting qualities echoing those of its namesake city in Japan, ancient beauty and elegance, strength and transcendence. 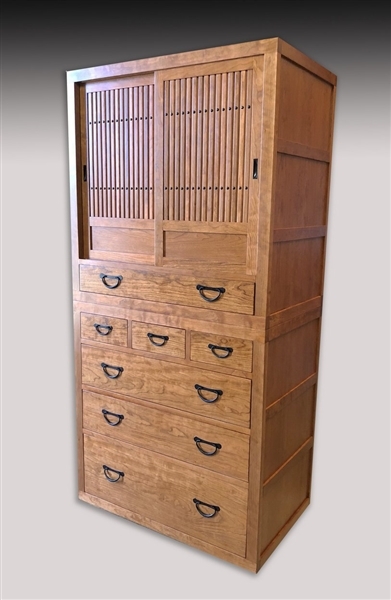 As with our entire contemporary collection, we customize to your personal needs both in composition and size, using sustainable woods and traditional Japanese woodworking techniques Dimensions: 76" high x 40" wide x 18" deep. 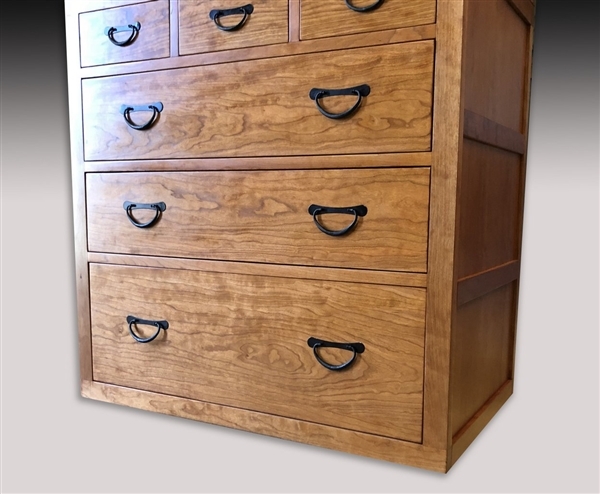 We make every effort to be as accurate as possible in describing our catalog items. All are guaranteed to be as represented. We do, however, offer a 7-day return policy consisting of a full refund less shipping upon receipt of the item in its original shipped condition. To qualify for a full refund less shipping, you must notify us by email within 7 days of the date of receipt. Do not return items without prior email notification, as this may result in delivery after the 7-day deadline. There will be no exceptions to this rule. Items purchased in a free-shipping promotion will be refunded in full minus the actual shipping costs.